What I want to know is just how they're running "normal" northbound service out of the airport, while making everyone southbound transfer at College Park? The equipment still has to go south to become northbound trains. But this is just another example of MARTA's overall lack of ability to respond to emergency situations. On an actual railroad, they would put some wooden boards under the wheels, and have another train, or one of MARTA's diesel locomotives, pull the disabled train over them and back onto the tracks. Takes about an hour. Instead, MARTA has to go find a fancy schmancy crane. But I want to address the post above that suggested the operator was going too fast. Though we know that's not the case based on the rest of the train making it over fine, I do want to point out that its signaling system wouldn't permit that. MARTA uses a strong-speed signaling scheme, with low-information wayside signals, and speed information transmitted into the cab. Except in yard and coupling operations, where speed is limited to 10mph, the speed commands will trigger the brakes if overspeed in either manual or automatic operation. Red and Gold train are terminating at College Park, using the pocket track to reverse service. There is 1 train shuttle from CP to Airport along with Bus Bridge. Only the derailed, married pair of railcars remain at the interlocking, freeing up 1 track into Airport Station. The 6th railcar derailed, causing the 5th rail (married pair) to partial derail. 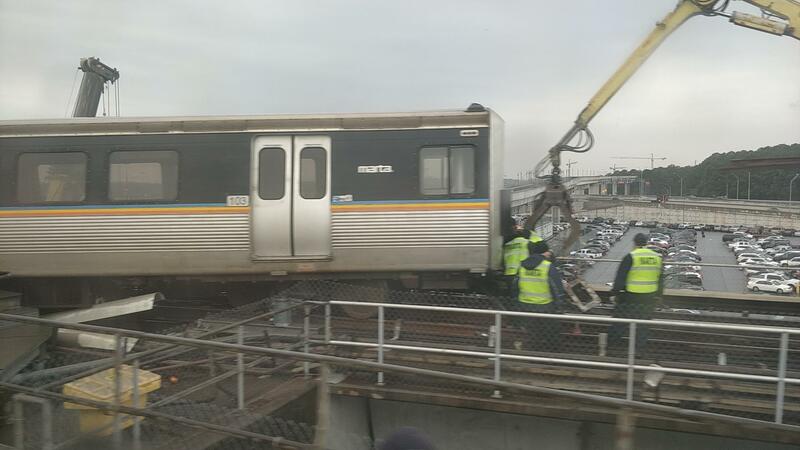 MARTA will not know what caused until the derailed railcars are removed. As a daily MARTA user, it's very concerning to me. They barely have it together on a regular day. On Monday morning this week, six southbound trains arrived at the East Point station while I was waiting on a northbound train to arrive. That's an extreme example, but the equilibrium between trains in wildly inconsistent. Yeah...I used to think it was eastbound trains that are always having problems but it's really the northbound trains. That's bizarre. Maybe the switch triggered before all six cars had crossed it? More than likely it's what's known as a "picked switch" where the flanges of the wheels for whatever reason follow the rails in the other direction than the direction the switch is set for. It's actually not that uncommon on railroads, it's usually due to maintenance issues. I have noticed lately that Marta train rides feel much "jerkier" than they used to. I used to be able to stand up without really holding on but that's not the case now. Not sure what the cause of that is but apparently it's' something. It's a little scary on elevated track between Lindbergh and Arts Center. What I want to know is what exactly do they do during the weekends of single tracking? Isn't it supposed to prevent stuff like this? I was actually thinking about the notion of running trains properly because it is extremely frustrating when there's a huge crowd of people who need to go in one direction and they are standing around waiting while multiple trains going in the direction nobody seems to need pass by. I have no solution for this because for the Super Bowl, people will be coming and going from all directions. So imagine you are at 5 points and you need to go north. You may see trains heading south that look useless, but those trains were probably useful upstream when they were bringing people from up north into town. The train will continue to the airport, so it will necessarily have to travel when few people are riding it. I'm not sure how MARTA can figure out exactly where people will be coming and going from, but to say they must have access to some data that could help advise this to at least some degree. I hope they use it because people trying to get to and from the stadium will certainly be frustrated if they see a bunch of empty trains go by as they are forced to wait. "I have ridden mass transit all over the world, and MARTA riders are by far the rudest I have ever encountered." It's true that MARTA seems to have many riders who engage in loud, profanity laden conversations with each other, sing along to music they are listening to in headphones, play music on their phone speakers, or engage in other behaviors that can range from discourteous to purposely disrespectful. I'm not sure what we can do about that, it seems to just be the culture of Atlanta. I hope residents behave when we are on the world stage. To segue into my next point, I'm not morally opposed to profanity. I use it and I don't believe it is a sign of lack of intelligence by itself. However, I don't use it loudly just for the sake of offending others. I understand most people doing this are young, and bucking authority is part of growing up. I wish more people wouldn't be afraid to correct these young people when they see it happening, but I also understand the fear factor. My next point is I'm a Howard Stern fan, so obviously not a prude when it comes to frank language. Anyone who listens to Howard, or any other program that originates from New York, will occasionally hear discussions of the subway as it is an inherent part of life in that city. They frequently complain about service the same way we do. Delays from single tracking, hot trains, rude people, etc. That seems to be a fact of life when you are using mass transit almost everywhere. Ok, maybe not Tokyo, but just about everywhere else. Still, the common notion seems to be that MARTA riders display the worst behavior of any riders in the world. And just one final point/question: I was surprised to hear about single tracking around Lindbergh. I remember when single tracking here happened all the time because they were constructing the new Lindbergh development. That was 10 years ago, why would there still be single tracking in this area? I do remember one time riding a packed train here, and on the overpass, you could really feel the train lean to one side. It was scary, I thought it might tumble off the track. In closing, when the Super Bowl is here, I hope MARTA will run trains efficiently, riders will behave, and there shouldn't be any single tracking anywhere. People do love to hate on Atlanta, so let's not give them anything legitimate to go home and complain about. We have a bit of a rough history with the Olympic Park bombing, rain leaving tens of thousands of people stranded at Tomorrowworld, and major MARTA hiccups during big football games. I'd really hate to add yet another reason one could legitimately make the argument that Atlanta is backward and not a good city for hosting massive events. We have plenty of great success stories, so hopefully we will see another! True, but that has more to do with how Japanese culture discourages being outwardly negative in public like that. Trust that Tokyo's transit network deals with the same problems with repairs, delays, and other stuff that every other city does. Delays in Southbound Red/Gold Line service. Northbound train arrives at Arts Center. Train operator and supervisor on platform inform riders that train is out of service. They unload the Northbound train. Train operator closes down the NB cab and begins operation of SB cab, train reopens as SB Airport train and riders waiting for delayed trains board it. All this took place within 5 mins, but it worked at Arts Center because there is an interlock just south of station that the train used to move from NB tracks to SB tracks w/o delaying other NB trains. I hope MARTA is prepared as well and do not think that this incident should be an indication that MARTA will fail in some way as it was a freak accident that caused 0 injuries.